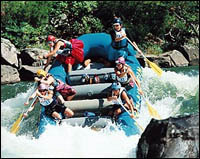 Modern equipment used by outfitters has many safety features, and river guides have extensive training that includes many safety precautions. Plus, each trip begins with instruction in how to raft safely. No! Although some rivers are suitable only for experienced rafters, many sections of West Virginia's rivers are perfect for first-time rafters, including children. Most outfitters offer trips geared to varying levels of experience. Just be sure to discuss your needs with the person who takes your reservation, who will be well trained to guide you to the right option for you. Indeed you can if they're at least 6, the minimum age for most family trips. 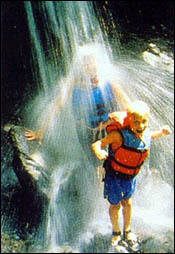 Lots of youngsters form some of their best family memories rafting in West Virginia. Generally wildwater is deeper in pools and shallower in rapids. The actual depth depends on the time of year (springtime normally finds the rivers with the greatest volume of water) and, of course, the amount of precipitation that has fallen in the area recently. Count on it-but you don't have to be uncomfortable. Your choice of clothing can make a big difference-cotton holds dampness, but wool, nylon and pile don't. That also depends on the season. A bathing suit or shorts with tennis shoes and sun screen do the job in summer. For spring or fall, when the weather-and the water-is cooler, bring a cap, a wool sweater and socks or "pile" clothing, and tennis shoes. Most outfitters have wetsuits available for rent if needed. Whatever the season, be sure to bring a change of clothes, a towel and dry shoes for post-rafting activities. How accessible are these whitewater sites from where I am? West Virginia's rivers are within 500 miles of half of the population of the United States via major U.S. highways. There are three clusters of whitewater locations within the state: The Potomac and Shenandoah Rivers at the easternmost point of the state's Eastern Panhandle; The Cheat and Tygart Rivers, North Branch of the Potomac River and Big Sandy Creek in Northern West Virginia; and in the southern part of the state, the Gauley, New, Meadow, and Bluestone Rivers. Just about anything you'd like to do. If you yearn for still more adventure, there's swimming, canoeing, fishing and hunting, hiking, rock climbing, mountain biking, and horseback riding. But if calmer pursuits appeal, you'll find quaint historic towns with wonderful antique shops, unique art galleries and craft shops, to explore as well as museums, outdoor theatre and concerts, delightful cafes and modern shopping malls. Most of West Virginia's whitewater is near terrific state parks and breathtaking scenery, and if golf's your love, you won't lack for enjoyable options To learn more, check out the coverage of West Virginia's regions further back in this publication and contact the visitors bureaus in the area of interest.